July 31st, 2014 12:26 PM | by William Bell | Eschatology. The book of Genesis records the promise that God would bless those who blessed Abraham and curse those who cursed him. But what exactly does this mean? For many Christians, it means ignorance of who God’s people really are. So many are focused on the Zionist state of Israel that they believe supporting them is doing God service. For some, their knowledge of God is so shallow and their egos are so large that it appears all they care about is to say they understand Bible prophecy is being fulfilled. This is a tragedy and a travesty. When God made the statement of blessing Abraham, he was not speaking of land, but of life. This is what Paul tells us in Galatians. The lack of understanding of who are the true sons of God is the shame of those who call themselves followers of Christ. Who is the true seed of Abraham and what is the true purpose behind the Seed? The seed is not the “many” but is the one. “Now to Abraham and his Seed were the promises made. He does not say, ‘and to seeds,’ as of many but as of one, ‘and to your Seed,’ who is Christ.’ (Gal. 3:16). It is only through becoming united with Christ that the natural seed of Israel and the Gentiles became the seed of Christ. They do not become many seeds through their faith in him but they become one with him. The true meaning of being a son is the privilege of the inheritance. In the parable of the vineyard, the vinedressers said of the son of the husbandman, “This is the heir, let us kill him that we may seize upon his inheritance. The reason they wanted to kill the son was because of his entitlement to the inheritance. Is it not foolish to believe that Palestine was the inheritance of Christ. Did he not reject the entire known world when Satan offered it to him during his temptation? (Matt. 4:10) Since Jesus had already rejected Palestine and an earthly throne (Jn. 6:15), how could that possibly be the inheritance? But is not the inheritance the blessing of Abraham? Was land the promise of Gen. 12:3? Paul quotes from the text and says that God would bless the Gentiles through faith. 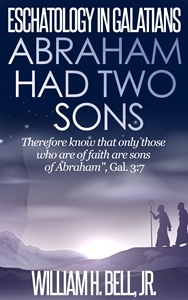 “And the Scripture, foreseeing that God would justify the Gentiles by faith, preached the gospel to Abraham beforehand, saying, “In you all the nations shall be blessed.” (Gal. 3:8). In other words, the promise of Abraham per Gen. 12:3 is not land. It is justification through faith. To misconstrue this text and arbitrarily force it to mean blessing those who reject Christ as the Messiah results in a flawed interpretation. In our next installment we will continue the message on the blessing of Abraham. « What’s Happening With Covenant Eschatology?